ALEXANDER HAMILTON. 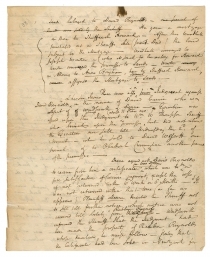 Autograph Manuscript, c. November 1796, Notes regarding Margaret Currie, administratrix of David Currie v. James Reynolds (scire facias), 2 pp. Lands belonged to David Reynolds,…one parcel of land was sold by the sheriff He gave a mortgage on them to Sheffied Howard.…assigned the Mortgage to Samuel Sands. There was also a prior Judgment against David Reynolds & his son James in the name of David Currie who was Agent of Wadsworth & Deane.… Deane agreed with David Reynolds to receive from him a certificate for 1000 Dollars which was to be in full satisfaction…. James Reynolds about 6 Months ago came forward to claim these lands in virtue of a deed from his father prior to Sands mortgage. The deed expresses a consideration of 15 or 1600 pounds & it is expected proof will be made that 800 pounds were actually paid at the time of executing the deed. [James it is believed was then of Age]. The father after remained in possession & but his son James retained the possession & disposition, till the sale to Townshend, who ever since the sale to him has been & still is in possession. At the time of the same James was absent from the Country but shortly afterwards returned & built a house in the neighborhood but never claimed the property nor was his deed ever heard of till lately. Joseph Reynolds, Brother of James is one witness, & Richard Langdon who shot himself the other. John Barbor says he will swear to payment of 800. As commissaries during the Revolutionary War, David Reynolds and his son James were responsible for raising supplies for the army in Orange County, New York. Their speculations for private gain in that office left them indebted to the Connecticut mercantile firm of Barnabas Deane & Company, among others. In 1783, David Currie, as agent in New York for Barnabas Deane and Jeremiah Wadsworth, sued both David and James Reynolds. Currie was successful, but the sale of land to satisfy the judgment was delayed by nearly two years. Meanwhile, other creditors held mortgages, and some of the same land was sold to pay other debts. From the summer of 1791 into 1792, James Reynolds had blackmailed Hamilton into paying him several “loans” to keep his affair with Maria Reynolds secret. In November 1792, authorities arrested James Reynolds for illegally purchasing Revolutionary War veterans’ pensions and claims for back pay. Before Reynolds was released from prison and disappeared, he threatened to expose Hamilton. While nothing came of it at the time, four years later James T. Callender exposed Hamilton’s affair and also charged him with financial corruption in cooperation with James Reynolds. Denying the latter charge, Hamilton admitted to the affair in his Reynolds pamphlet, published in 1797. 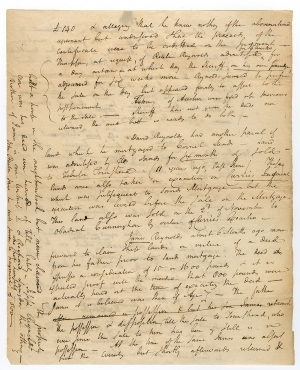 Hamilton likely made these notes to aid his own understanding of the claims. When Currie’s widow, Margaret Currie, revived the case in 1796, the claims and counter-claims had become quite complex. Hamilton seems to have represented one or more of four Cunninghams—Abner, Obadiah, Andrew, and Charles—who had become involved in the tangled land titles. Reuben Reynolds, a son of David Reynolds and younger brother of James Reynolds, also became involved through a writ of fieri facias to have some of his father’s land sold to settle the debts. 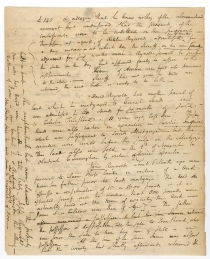 Very little documentation from this case survives, and before the discovery of this manuscript, nothing was known of this particular connection between Hamilton and Reynolds. David Reynolds (d. bef. 1796) was born in Dutchess County, New York, and served as a commissary of purchases under Jeremiah Wadsworth and procured supplies for the army from Orange County from 1777 to 1780, when his credit failed. By 1783, he was in prison for debt. James was one of David’s six children. Sheffield Howard (1705-1788) came to New York c. 1741 and became a merchant. His younger brother Charles became the 10th Duke of Norfolk in 1777. Most of Howard’s wealth consisted of land and mortgages in NY and NJ. A Loyalist, he filed a claim with the English Parliament for restitution of illegally confiscated property. David Reynolds gave a mortgage on the land in Cornwall to Sheffield Howard in 1776. Samuel Sands bought the land from his representatives, and in 1792, sold the land to Abner Cunningham. In 1796, Reuben Reynolds sued the Cunninghams to regain possession. Hamilton represented one of the Cunninghams, who conveyed the land to George Brown in 1795. Brown deeded it to Isaac Tobias in 1799. In 1801, Reuben Reynolds sued Isaac Tobias in the New York Court of Chancery, and Hamilton was also involved in that case. Samuel Sands (1723-1792), in 1763, became the first clerk of the parish of Newburgh, and in 1773, was elected as the first clerk of the town of Newburgh. In 1775, he was a member of the Committee of Safety and Observation. David Currie (1749-1794) was a dry goods merchant who married Margaret Sebring (1749-1842). From 1777 to 1779, he served as a commissary buying clothing and other supplies for New York soldiers. In 1778, the New York legislature appointed him as sutler. After the war, he and his brother Archibald resumed the dry goods business as Archibald and David Currie. He was one of the reincorporators of the New York Chamber of Commerce in 1784. Jeremiah Wadsworth and Barnabas Deane were partners in the Connecticut mercantile firm of Barnabas Deane & Company. In February 1783, David Currie, as the New York representative of Wadsworth and Deane, filed suit against David Reynolds and James Reynolds for non-payment of debts. In September 1783, the court ruled in Currie’s favor and awarded £830 and costs, but the sheriff did not execute the judgment. On August 6, 1796, Margaret Currie, administratrix of David Currie, instituted two scire facias proceedings against George Brown, terre-tenant of David Reynolds, deceased, and against James Reynolds to revive the earlier judgments, and the sheriff sold at least some of the land on November 2, 1796. Narratio, October 29, 1896, Margaret Currie, Administratrix of David Currie v. George Brown, Alexander Hamilton Papers, Library of Congress. Abner Cunningham was a merchant and lived in Cheesecocks (Monroe), Orange County, New York, in 1800; Obadiah Cunningham served as a road commissioner and constable in Cornwall, Orange County, and in 1800, he lived in Cheesecocks; Andrew Cunningham (1760-1829) also lived in Cheesecocks, in 1800.